Avion Dental has a long history of working to serve others in their community and throughout the world. Comprised in their design is a feeling of professionalism and hope that they wanted to share with the world, led by Dr. Robert M. Kimm. This team of dental professionals makes helping those in need through their work, even funding a yearly missionary trip for under-served populations throughout the world. The overall design of this site contains a variety of bright and inviting styles that build on an underlying concept that a “Smile is a curve that sets everything straight.” You can see the elements of a smile present in the initial image bordered by two blue curved lines, with the straight lines of the windows and chairs subtly suggesting teeth. 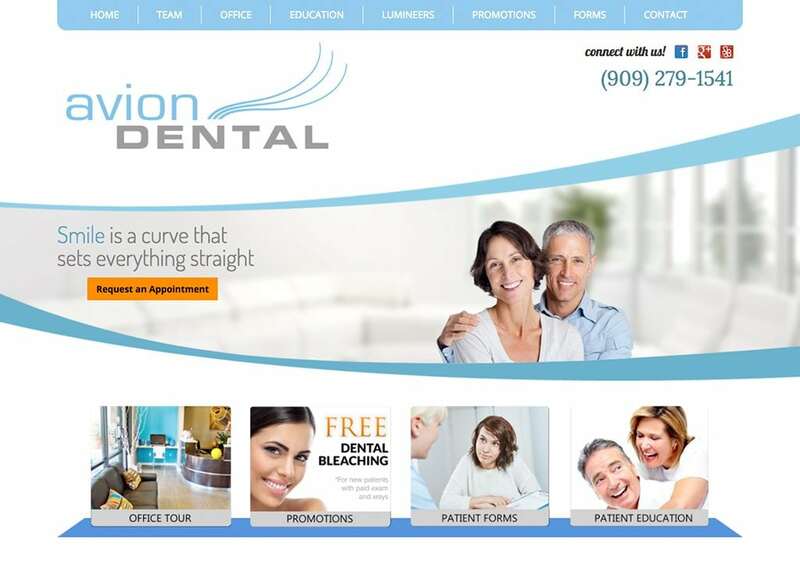 The overall design is intended to be inviting and welcoming as Avion Dental is focused on building relationships with their patients that last a lifetime. Blue and white are excellent colors to bring confidence and hope to those visiting the site. White ensures that the site is bright and uplifting, while also presenting a feeling of purity and professionalism. Blue is calming and inspires hope in viewers, one of the many reasons that it’s commonly used in websites and buildings that are associated with medical concerns. The splash of orange here and there is uplifting and inspires taking action, placed on a white background it draws the eye making it perfect for buttons. Everything about this website is designed to be low pressure and inviting, even the placement of the buttons suggest that their relationship with the client is far more important than the business they’ll provide. Once the clinic has had a chance to introduce itself it’s ready to start talking service and suggesting making an appointment to get more information and begin your treatment. This form of design is particularly appealing to clinics that don’t desire to present themselves as a high-pressure situation and are looking for patients who desire a command of their treatment free of pressure. Everything about this design, from color choice to the present of non-straight lines helps create that view. Their image is gentle and so is their approach to marketing. Just like this approach does nothing to hinder their practice, nor does the gentle approach do anything to hinder their marketing. The subtle elements are there, properly placed keywords and headings that draw the customer in from web searches, but the site itself also carries off the target goal well. Soft yet prevalent links at the top that encourage inquiry, a phone number that says ‘reach out and talk to us’ and links to their social media all hint at the desire to build relationships with the customer. A gentle, approachable dental practice that invites you to become part of their family, and wants to become part of yours. Throughout the site educational information can be found without the use of bright, over-the-top pictures aimed at catching the eye and demanding attention. Visitors to this site will be picking up the phone to call a clinic they already consider an old friend, all thanks to the steady and comfortable design.